We arrived in Bangkok Airport at around local time 9 + am and immediately we went to the Hertz car rental counter to collect our car. There were few other car rental beside Hertz, there was also Budget car rental. There were at least about 3 to 4 car rentals counter in the arrival hall. I could not remember the rest of the car rental. We waited for quite a while, about an hour. Normally we do not need to wait for so long for car rental in other countries. We also were shocked that there was no GPS in the Toyota Altis that we rented. We actually booked the car online and we ticked the car with GPS but because there was no confirmation so the cars left for that day were all without GPS. We have no choice but to take it. So please get the “confirmation” of GPS when you booked online. Luckily we have subscribed the Data roaming back home so we could use freely in Thailand. The only other problem was the battery will be running low and we have forgotten to bring the car charger and portable charger. Anyway, we leave those problems aside first and quickly started to get familiarize with the car and set our destination — “Ayutthaya” in the google map in our mobile phone. Driving in Thailand is easy for us, the driver seat is in the right hand side which is the same as all the commonwealth countries. So there is no fear to get use to the car. From Bangkok Airport to Ayutthaya 95km, normally it takes about 1 to 2 hours. Since we did not go in to Bangkok city, we could avoid the traffic jam. We could see many cars and taxis were driving into the Bangkok city area. 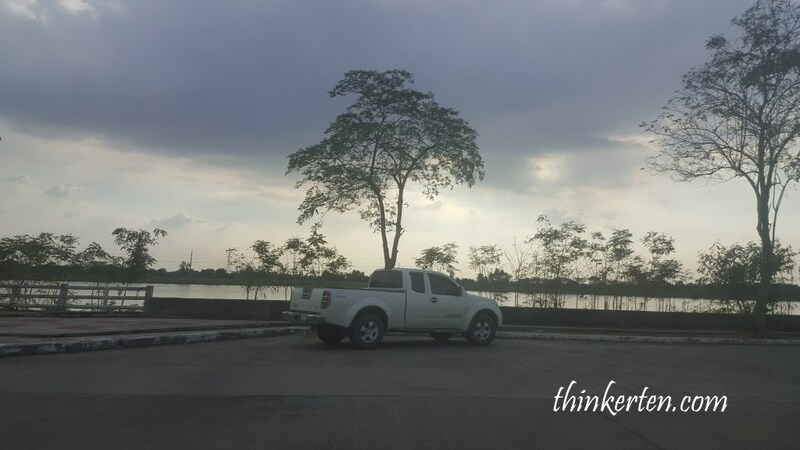 After about 30 mins of driving and passing the outskirt of Bangkok, we were finally driving in the countryside, which for us is so calm and relaxing driving in such environment, able to enjoy the beautiful scenery. We stopped at around 1 pm along the highway and have our lunch. The lunch was cheap, about 50 baht per meal. I have the Pathai noodle and it was tasty. The lady owner cooked in front of you with a small wok. People are friendly in here. I asked the owner to lend me the power point to charge my phone so that I can continue using the google map and she gladly agreed. This is the way to go about as of now. The weather was extremely hot, even in Dec. I thought it would be a bit cooler but I was wrong. The heat was just too hard to tolerate. Please bring along umbrella to avoid direct sunshine to your skin. Please along hat as well to cover your neck area. If you have black hair, the more you need to use a hat as your hair color will absorb the heat from the sunshine. 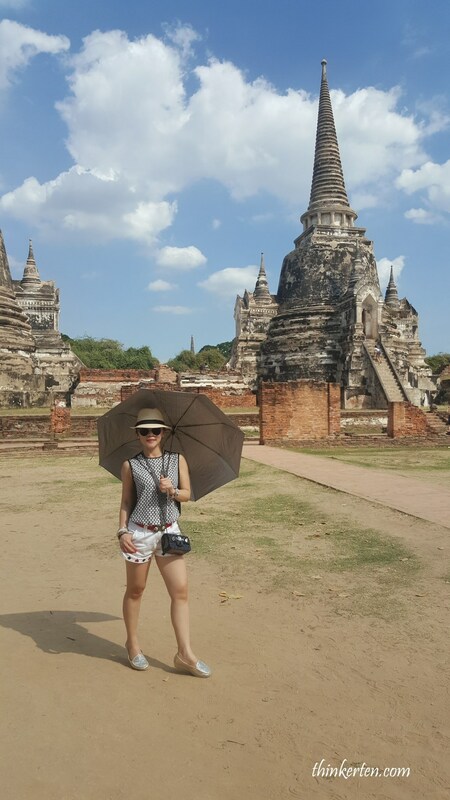 We finally arrived at Ayutthaya Historical park at around 2 pm. There were a spacious car park around the park and we park our car with no hassle. 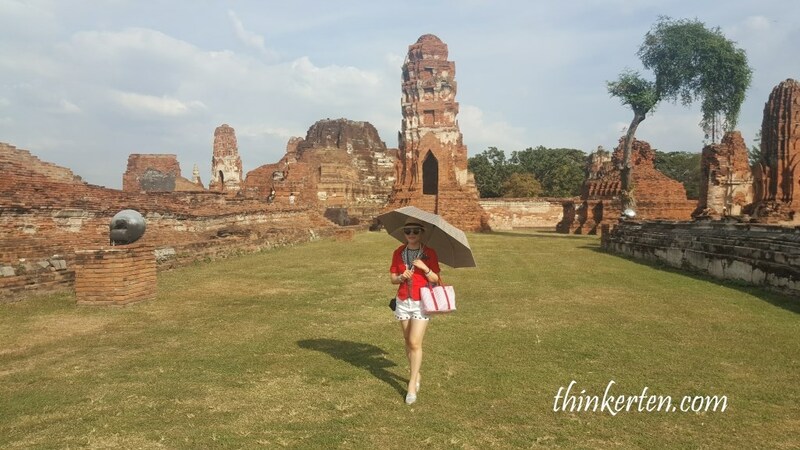 Then we bring along our umbrella and hat and of course with our comfy walking shoes to enter the Ayutthaya Historical park. Before we entered the park, there were many stalls that we have to pass through, well, the souvenirs or little stuff selling there are quite reasonable and for me, I found them actually the cheapest among my 8 days tour in Thailand. I have actually regretted to get more stuff while I passed through those stalls. 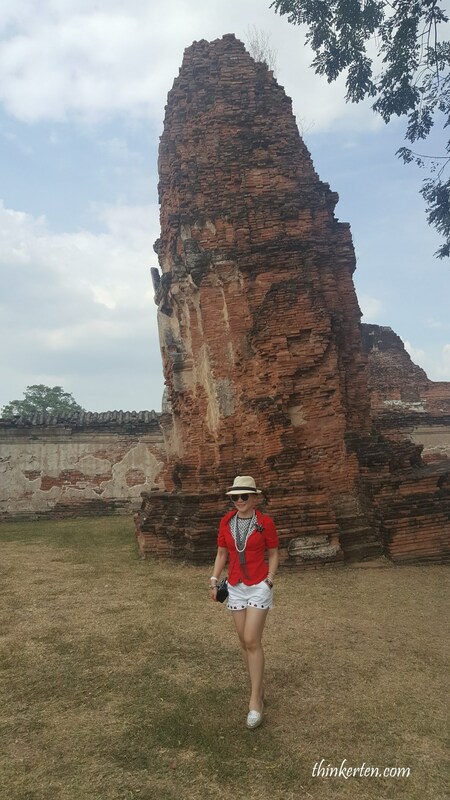 Since this is the first stop and first day, we did not intend and have mood to do shopping, instead we were so eager to check out the ancient ruin in the Ayutthaya historical park. Actually Ayutthaya from Bangkok is only 70km. 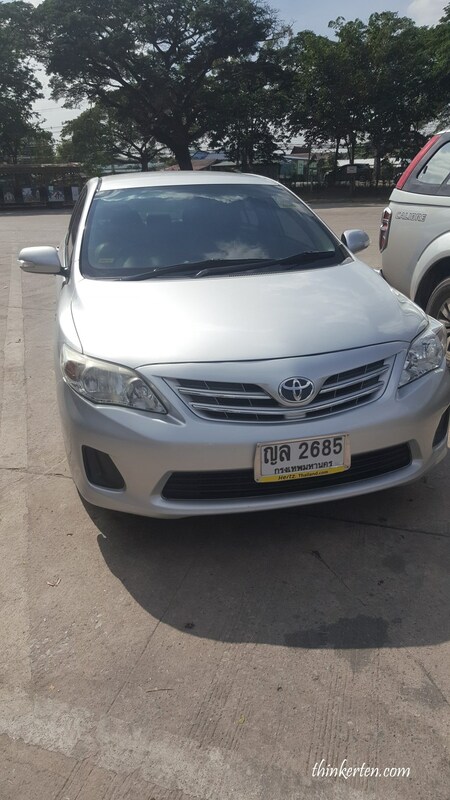 We took our car at 11 plus am and reached Ayutthuya at around 2pm because we stopped in the middle of highway to get our lunch and we were a bit slow to navigate our way out from the airport and fill the gas in the gas station. There was no entrance fee when we entered the park as it was due to the passing of the late King, all entrance are free of charge. 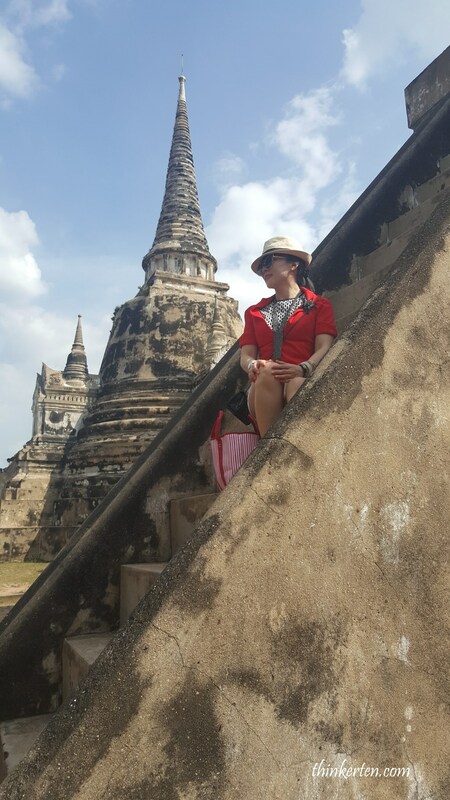 We have finally arrived the Historic City of Ayutthaya, world heritage, Unesco founded in 1350, it was the second capital of the Siamese Kingdom. The city was attacked and razed by the Burmese army in 1767 who burned the city to the ground and forced the inhabitants to abandon the city. I was posing under the hot sun without the umbrella in order to have a better picture outcome. 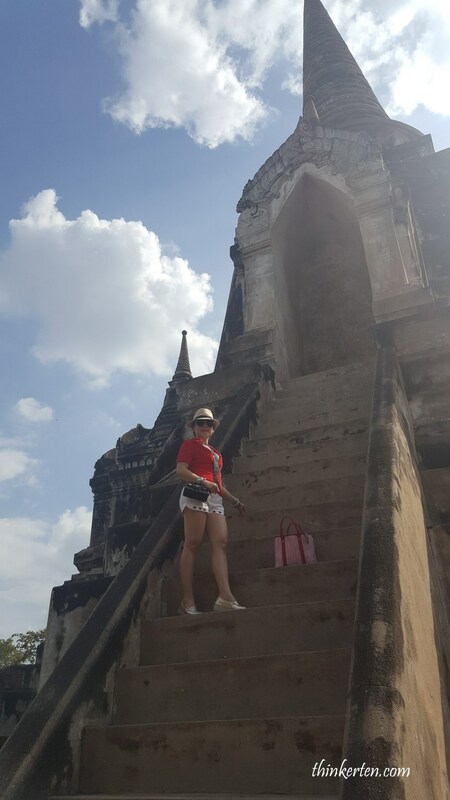 This ruin is very beautiful and I have to climb many steps to reach the top. That is why I mentioned one has to wear a comfy shoes. The steps up is really a good workout for the lower body. Despite the hot weather, I purposely brought along my red summer jacket to wear it in order to have a better image in the picture. Also, it can help to cover my neck and shoulders areas to avoid direct sunshine and have sunburn later. It was both eerie and sad strolling through the crumbling runis of an ancient civilization. Most Buddha heads were missing. I was glad that I could still find few Buddha with the Head on it. After taking some pictures and have a fresh coconut 50 bath at the nearby stall, we then moved to the other side of the historical park where we wanted to see the buddha head under a tree root. 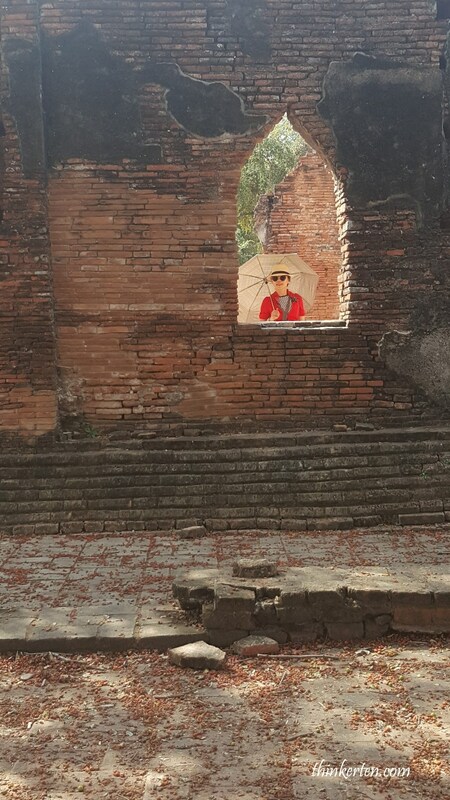 This is in Wat Mahathat about 5 to 10 min drive from the main historical park. At first we wanted to walk to the Wat Mahathat but it looked like a bit far for us and we suddenly lost the sense of direction even though we have a google map with us. So we drove there, this time the parking lot is very small and the parking areas are full of tiny vans carrying tourists from Bangkok I guess. Anyway, we managed to get a spot to park our rental car and we entered the Wat Mahathat free of charge again. 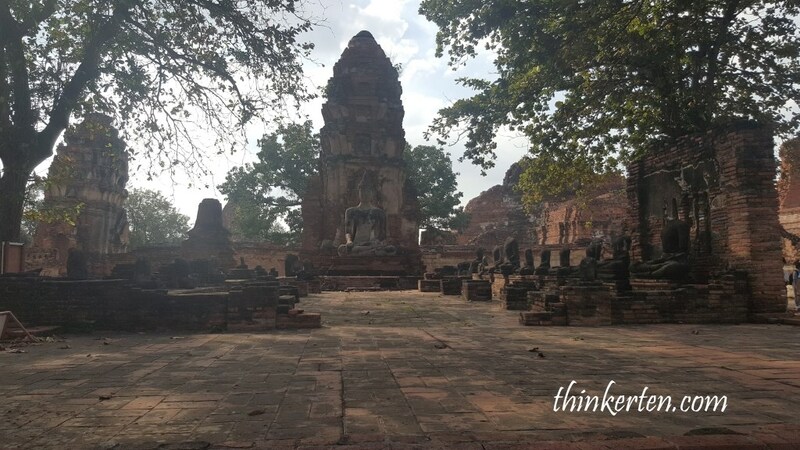 The Wat Mahathat is slightly smaller area compared to the main ruin. We walked one big round but we still could not find the Buddha head under the tree root. We got frustrated and wanted to leave the place without seeing the Buddha head under the tree root. However, I refused to leave without taking one glance so I went to the entrance booth and asked the person who could speak fluent English. I pointed the picture of the buddha head under the tree and asked for direction. He told me it was on the left hand side once you entered the park. To my relief, once I entered the entrance gate, I saw so many people standing around some big trees on my left hand side. Just 1 min walk from the entrance toward the left. There were actually many people waiting to take the picture with this iconic image but luckily I managed to take a nice picture with a squatting pose. There is a signboard telling you how to take a picture with the respected buddha. One has to squat down. I guess standing up which is above the head of the buddha is kind of rude. So squatting down is the respected way to take a nice picture with this iconic image of Buddha head under the tree root. There is a discrete chain there to remind visitors of the fact that they cannot touch the statue. Why the buddha head is trapped under the root of the tree? 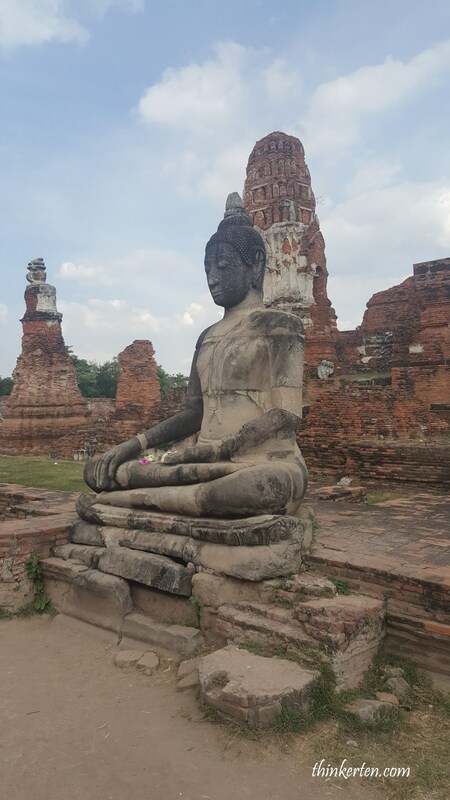 During the 14th century, the temple was destroyed by the Burmese who also vandalised many of the Buddha images in Ayutthaya by lopping off the heads. One theory suggests that the tree simply grew around the Buddha head during the period when the temple lay abandoned and overgrown. We left the Wat Mahathat at around 4 pm and headed to our hotel 42C the Chic Hotel in Nakhon Sawan 166km away. It takes us about 2 hour plus to reach our hotel. Before heading to our hotel, I stopped by one of the Seven Eleven convenient stall in Ayutthaya town to get some stomachache medicine. I was feeling a bit unwell for my stomach. I do not know why, may be is the water or food that is not clean as I have sensitive stomach. Or could it be the fresh coconut juice from the stall near the historical park?? I don’t know, I just get some medicine before my stomach condition get worse. The young lady who worked in the Seven Eleven could not understand English and I was doing the action for her to understand me, luckily there was this lady with a headgear, I believed she is muslim, meaning there were quite some muslim living in Ayutthaya, she was helping me to do the translation into Thai to the young lady who worked in Seven Eleven. After about 10 mins in the Seven Eleven, I finally gotten what I wanted. Moral of the story, always bring along some personal medical needs for travel. Driving to the hotel is quite easy, the road is very smooth and wide, no bumpy or any holes in the Thai highway. At around 5+ pm, we reached Nakhon Sawan city, and I noticed the sky started to turn dark. We reached our hotel, 42 C The Chic hotel at around 6pm. The hotel is easy to recognize as there is a big signboard with neon colour with the hotel name 42 C The Chic hotel is hanging above the building. It was easy for us to spot it while driving from the Nakhon Sawan city. 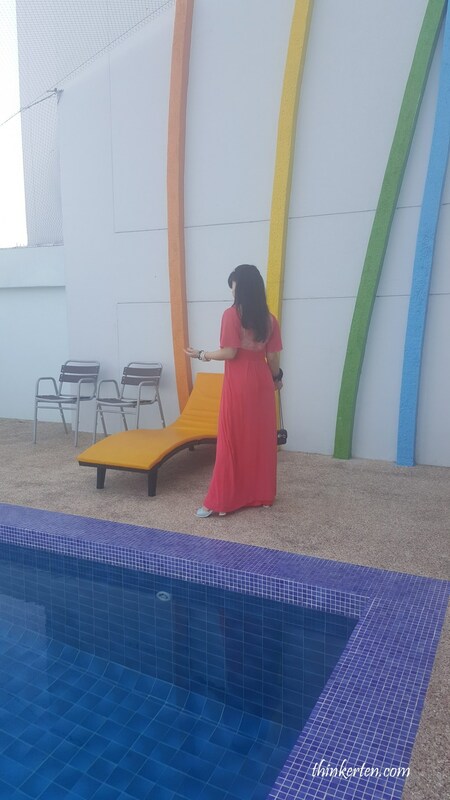 It was just situated at the left hand side and the hotel is about 5 to 10 min drive from the Nakhon Sawan city. We purposely choose the hotel which is not situated in the middle of the town to avoid traffic hassle and crowded people. However having said that, the hotel is still not isolated, there were so many food stalls and restaurants beside the hotel. You could either walked up or down from the hotel to get your dinner. We walked a little bit up, 2 mins and had our dinner in the food center. After our dinner, we did some shopping again at the seven eleven stall again. This time, we found the car charger which only cost us 299 baht. Without any hesitation, we paid for the car charger which mean we do not have to worry for the low battery warning in our phone and we do not need to stop by any shop or restaurant to ask for help for charging our phone. That was quite a relief. 42C The Chic Hotel, like the name, it is very CHIC, clean and new. Day1 – Itinerary summary and hotel details. I’ve absolutely no understanding of computer programming but I was hoping to start my own blog in the near future. Thanks for your kind comment. Writing blog is also a new thing to me. I like your suggestion and I will explore in that area when I am more familiar. Appreciated once again to visit my blog. Nice work Jane. Glad to see you’re still living life to the max. Hi Chris, your compliments definitely is a motivation for me.